Accepted to DPT School // What Do I Need to Do Before School Starts and What Supplies Will I Need? If you've made your way to this post then that probably means that you've been accepted to DPT school and if so - YAY, CONGRATS!! If not and you're currently applying and just curious about what needs to be completed before PT school and what kind of supplies you will eventually need, then that's just as exciting! Welcome! I felt like my to-do list was a mile long as I was preparing for PT school, but there's really no need to stress yourself out! There will be certain little tasks here and there that need to be completed, but the bulk of the preliminary things you need to complete will probably be during your orientation. But here's everything I needed to know, complete, and buy to prepare for my first semester! Do I need to register for classes myself or will the program do it for me? What kind of loans/scholarships/financial aid am I eligible for and how do I apply for them? Click here for a downloadable version of the following list. Textbooks are very expensive and the costs add up even quicker in grad school than they do in undergrad. But, trust me when I say you should try to get your hands on all of the required textbooks for your courses. In some courses, you may be able to share a textbook with someone else (and essentially share the cost) or even download an electronic copy for free (2nd year students passed down some downloadable PDF versions to my class). But in the end, you want to make sure you have access to all of the course material and never miss out on learning or understanding a concept because you don't have access to the textbook. I use Jockey brand - they are super comfortable and I love them! The price for scrubs can add up fast if you go for high-quality brand name ones. Cheaper styles are available at places like Walmart or thrift stores, but I recommend investing in at least one nice pair of scrubs that will last! If your school doesn't require a specific color, then I recommend the colors blue, grey, and/or black (dark colors will show the least amount of "yucky stuff"). Your program will likely supply you with these kind of technological devices. However, if they don't, make sure you have a reliable means of accessing all of the information and resources you need to be successful! Trust me when I say having a neat, at-home study space will make all the difference in your learning experience! Organization is key! 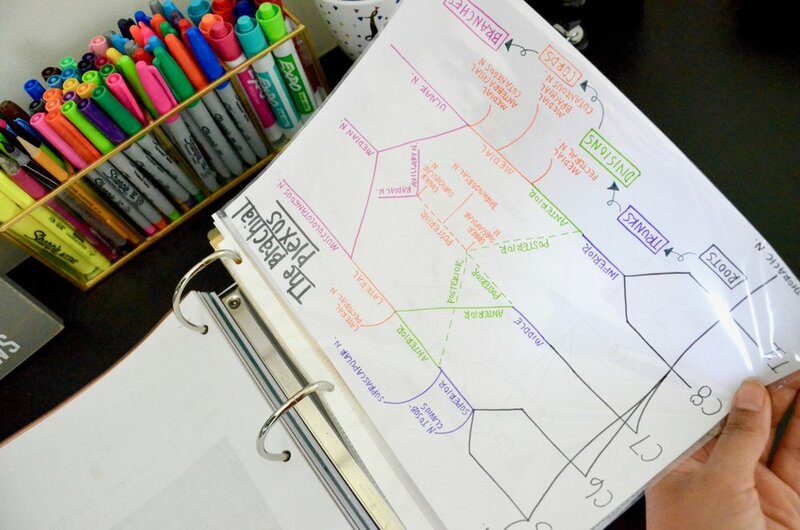 Don't be that person that has all of their notes and papers for five different classes shoved into one binder - organize your study materials nicely! Being organized makes all the difference in being mentally prepared to handle study tasks. Not only is having pretty writing utensils fun, but it will definitely take your note-taking skills to a whole new level! Drawing out pictures and concepts will help you stay organized with a systematic way to label things. It will also be much easier to recall information later on when you can remember detailed images of your colorful notes and drawings. Y'all - dry erase boards are MAGICAL study tools and I definitely recommend getting one for your at-home study space!! I bought this one from Amazon and it is SO nice having a dry erase board at home since it's usually hard to find an open one at the library. 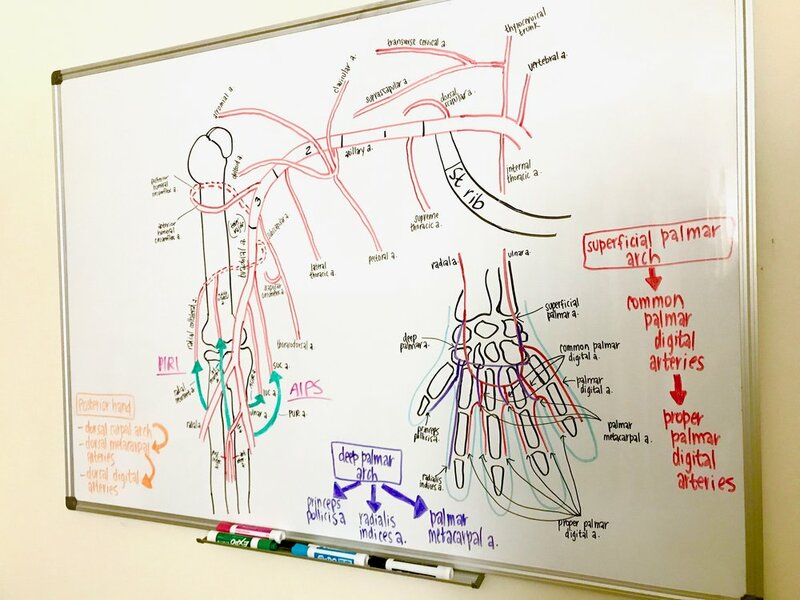 I do most of my studying at home and use the dry erase board daily to quiz myself and review study materials, mainly drawing out pictures, diagrams, flow charts, etc. It would also be helpful to have a second, small, portable dry erase board to take with you on the go! I typically use a Happy Planner but haven't snagged a new one yet, so right now I'm using this simple, super cute one from TJ Maxx that was only 6 bucks!